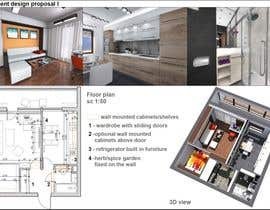 I need to design my tiny bedsit (35 square meters). - the picture of a small bedroom that I want to have. I would like to have at least 2 different kinds of design. Your rating and feedback would be much appreciated! Hi Laura I tryed to attache the file with the air conditioner new place, but it doesn't attache, I don't know why. Therefore this thing is on the wall with balcony door and window not where the picture "living room" shown. It's no problem.Go to design hand over. We can talk there about finding a way so you can deliver the new picture to me. You could correct it. Well, for the next time you know. And to write your brief clearly, also. Anyway the wining project is nice, your appartement will be nice. Thank you for re-accepting the project.Congratulations to the winner and good luck with your renovation! Please, dont reject projects, I dont understand why you do that? I designed what you are asking for, if you dont like it, that isnt for rejecting. Sorry but I just didn't like your project. Thak you very much for your job! And sorry again! Dear Sir, you wasnt clear with your wishes at the start of the contest, I do what I understood you want. So, I designed your bedroom as you like. Please dont reject before you look at it. I spend my time on it. Thank you in advance. 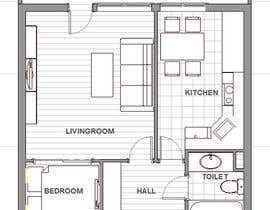 Hello, the design should be only for the bedsit, as you mentioned in the brief? 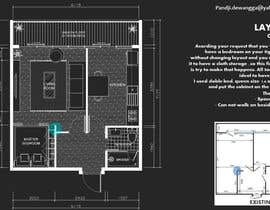 Because I saw that you asked someone to design also the rest of the rooms, for the same price. 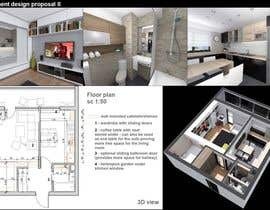 There are some differences between the 2d plan and the pictures (e.g. 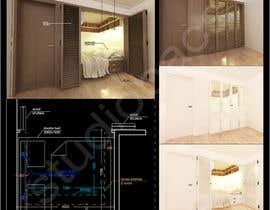 : dimension between the door from the living and the future bed sit - 658mm on the 2d plan, approx.100mm in the picture)- please correct me if I'm wrong; 3584 or 3548, for the living? Walls width? How do you want to be the rest of the space? I am also working on your contest, please do not close earlier. Hello again, how many beds would you like? 1 double bed (2.00meters x 1.40meters)? 1 single bed? 2 beds? Your bedroom dimention is 2033x1756 ! So I think you should have one single bed ! And you will have a small space beside your bed ! See my design ! Tell me If you want to change something ! Hope you like it ! Thanks ! 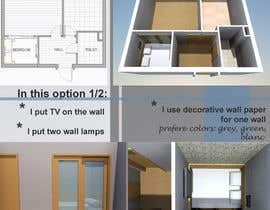 I also would like to know if you are you willing to demolish some walls to configure different spaces? or you just want a "furniture design" ? Hello, I would like to know what is the height of your apartment? 2.60meters? Dear Contest holder, I have added some image of my ongoing project at Dhaka, Bangladadesh. I am the best provider. We have a Company here name Crystal Architects. We are a team of licensed architects. Visit www.crystalarchitects.webs.com to see the building projects we have done. Also those images were for your reference only so that you can get an idea how I think. So what are you waiting for? Fire away! I can't understand why my proposal is rejected?Could you please explain me? Hi! As I understand the scheme of work, I make a contest that includes all my preferences, and you offer me your kind of design according to my preferences. You shown me only a picture doesn't fit me. Hi Stanislav, the bedroom picture you've attached, is that the bedroom you already have now or is that an example of what you want? 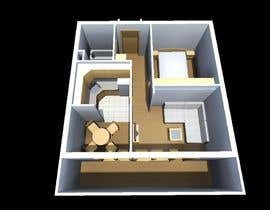 -- And could you please provide more picture of your apartment so we will have better grasp of your apartment? -- Thanks. http://www.realprice.ru/SYSTEM/2D_PAGE/II-68_03x3A.htm Look at this to understand more about my bedsit. Sorry but it's only in Russian. Dear crystalARCH! Do you see that this contest is guaranteed? Each of you have the same chance.First, all freelancers do their job and submit their version of the project and after they will be selected as a winner by the contest holder. Only after that your work will be paid! No offence? Hi, can you explain me Is this a project bid or a contest?